Posted on Fri, Mar 16, 2012 : 4:39 p.m. The intersection of Pauline and Seventh in Ann Arbor on Thursday night. Heavy rains caused 21 motorists to abandon their cars in the streets of Thursday, but Ann Arbor escaped relatively unscathed from the storm that ripped through Dexter damaging more than 110 homes. Police responded to 64 calls for service between 6 and 9 p.m.Thursday and six city streets were barricaded due to extreme flooding. Another street was barricaded due to a fallen power line. South Main, West Huron, Scio Church Road, West Stadium and East Stadium were all closed temporarily due to the storm. Three street signals lost power, but have since been restored. Additionally at least 12 apartments were flooded at Park Place and Manchester Flats apartments near the intersection of Stadium and Pauline, displacing more than a dozen residents. McKinley Inc. —owner of the two apartments— plans to place affected residents in other nearby apartment complexes. According to City Administrator Steve Powers, all streets have been reopened and the flooding has receded. No trees were significantly damaged by the storm, according to field operations manager Matt Warba. At least eight Ann Arbor homeowners called the city complaining of flooded basements and multiple gravel roads were eroded due to the heavy rain, Warba said. Several stormwater manholes burst during the storm, but no injuries or driving incidents were reported as a result. "It's not uncommon when you have two inches of rain in a 15 minute time period for the system to get somewhat overwhelmed," Warba said. 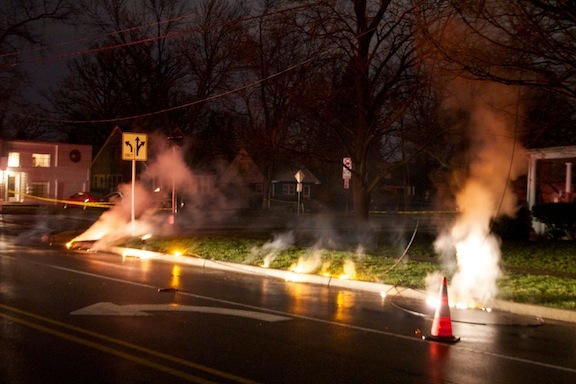 Two firefighters were injured Thursday when they were fighting an electrical fire. An updated condition report has not been available from the city. Sat, Mar 17, 2012 : 4:06 a.m.
What is that a picture of ? What happened to the 21 abandoned cars ? Three street signals lost power? Who cares? I prefer real newpapers and real stories. What would have been a really interesting story was what happened at all the local businesses when the warning was announced, and where customers took shelter. For example, I heard that the customers at a local crafts store were sent to the restrooms for an hour to wait out the storm, and Meijer's had the customers go into the milk cooler. What did they do at Briarwood ? This sort of stuff is more interesting than than three traffic signals not working. Journalism 101 - HUMAN INTEREST STORIES. Fri, Mar 16, 2012 : 10:21 p.m. Cool picture. What is it of? Downed power line? Sat, Mar 17, 2012 : 3:22 p.m.
Yup. We saw one go down and make a big noise and fire. What a nite that was. Fri, Mar 16, 2012 : 9:51 p.m.
We always survive because our forefathers built this city on rock and roll. seriously, look where Ann Arbor lies, in a valley along a river, nestled between hillsides and depressions. Fri, Mar 16, 2012 : 9:22 p.m.
As my husband and I sat glued to our TV we were surprised that we didn't hear any emergency sirens to warn us of the possible tornado here in Ann Arbor. And those usually annoying interruptions of your favorite program to test the emergency system also seemed to be AWOL yesterday. things need to be improved on this score. Sun, Mar 18, 2012 : 3:12 a.m. Hear the sirens loud and clear on the East side of town. The warning sirens are great - let's make sure they work across the whole city.